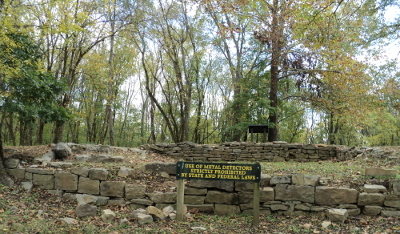 Port Royal State Historic Park was an encampment site for the Cherokee on the Trail of Tears, and is an official site on the Trail of Tears National Historic Trail. 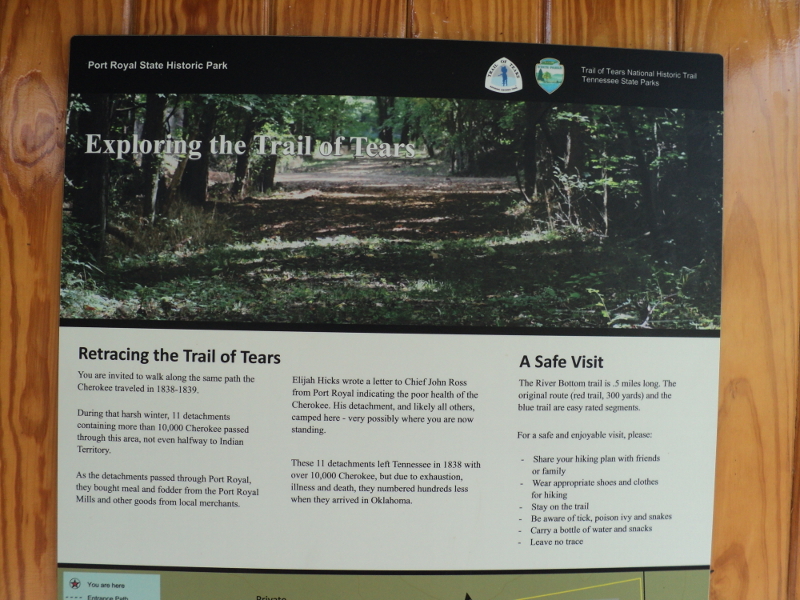 It features "The Trail of Tears" hiking trail, an original, preserved, 300 yard-long section of the Trail of Tears certified by the National Park Service. 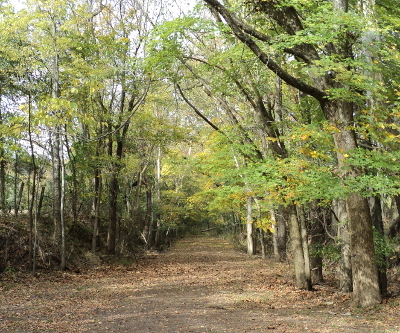 This trail was also a road used by Native people long before contact with Europeans. 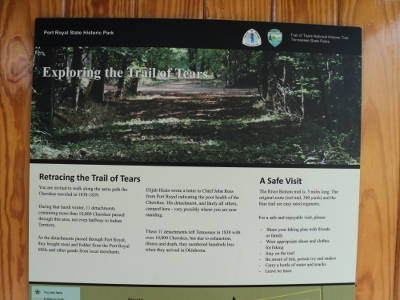 An interpretive kiosk at Port Royal State Historic Park displays information about the Trail of Tears. 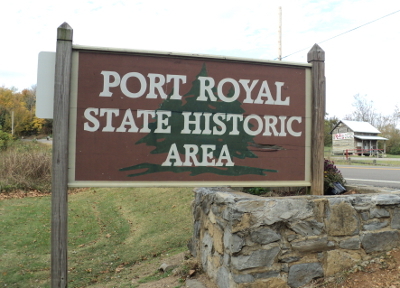 The town of Port Royal, founded in 1797, was located at a strategic navigation point on the Red River and also on a major stagecoach line, the Great Western Road, which followed the ancient Native road mentioned above. The foundations of old buildings, some dating to the 18th century, are still visible in the park. 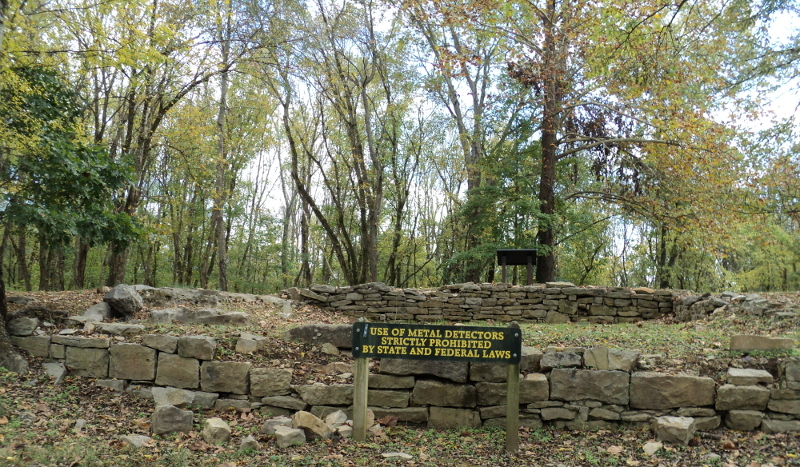 The stone foundation visible in the photograph below dates to at least 1836 and supported the Mallory Way Station, a tavern and stagecoach inn that was in use at the time the Cherokee camped here on the Trail of Tears. 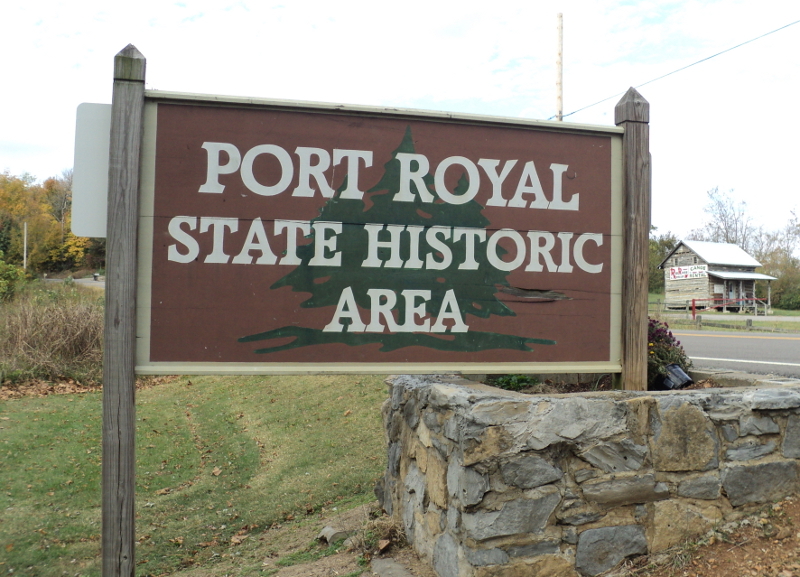 Because of it's location, Port Royal had become a major town with many businesses by the time the Cherokee passed through in 1838. The interpretive sign below tells the story of Port Royal's stores. In addition to the "Trail of Tears" hiking trail, the park also has the "Overlook Trail", a 100-yard long moderately difficult trail along a bluff overlooking the Red River, and the "River Bottom Trail", a .6 mile long hike through the river bottom. 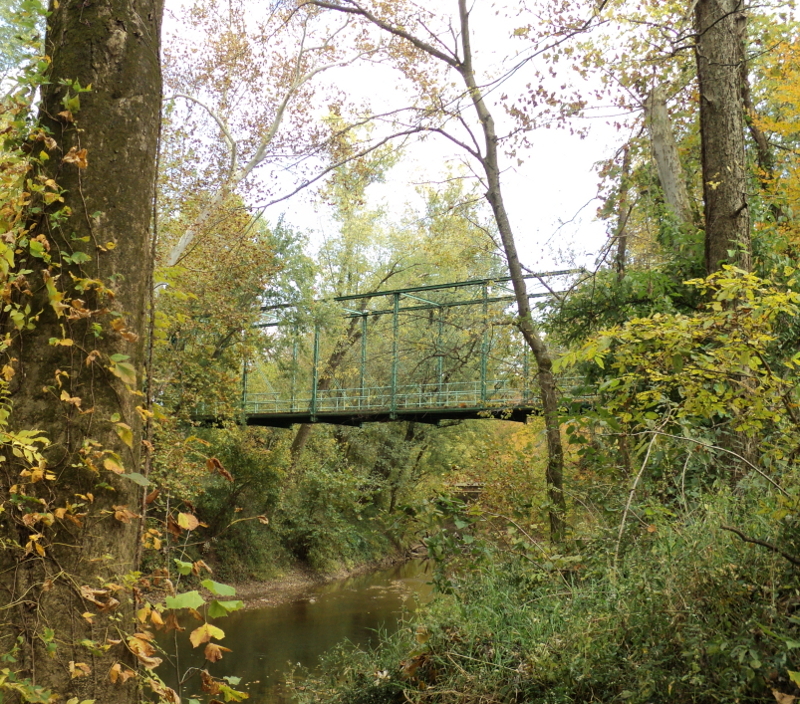 You can also walk along the old Main Street of the town and cross Sulfur Fork Creek on a steel Pratt Truss bridge built in 1887. The park is near the confluence of Red River and Sulfur Fork Creek and has a canoe launching area (all boats must be able to be carried by hand into the water - no trailers allowed on river access), and according to the park web site, the fishing is excellent. The park has picnic tables and clean, permanent, ADA accessible restrooms. Food and drinks are available at the Port Royal General Store and Cafe, just across the river on Highway 238. 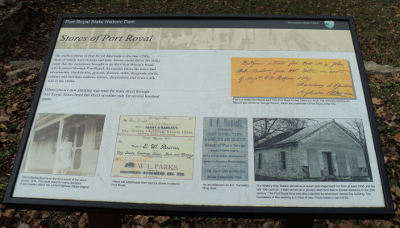 Port Royal State Historic Park is located at 3300 Old Clarksville Hwy., in Adams, Tennessee. 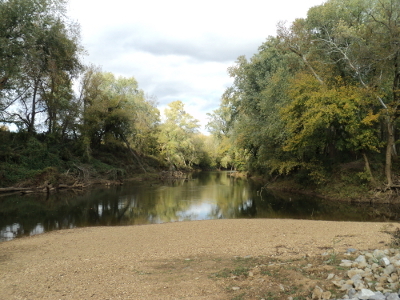 The park is about 12 miles from Clarksville, Tennessee. Park hours are 8 am CST to sundown 7 days a week. Directions: From I-24 take Exit 11, head towards Adams on Highway 76, go about 5 miles and turn left on Highway 238/Port Royal Road. Go about 1 mile to the park. The Trail of Tears hiking trail is just across the bridge over the Red River, on the left. When you turn in to the parking area you'll see the interpretive kiosk. Park Map in pdf format.